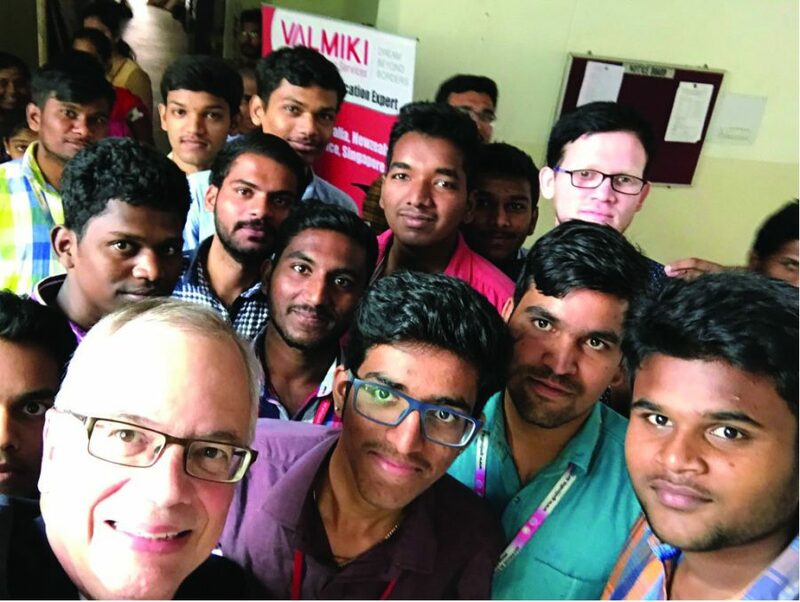 Gilbert takes a selfie with members of an all-male Indian university. Despite having to brush his teeth with bottled water for eight days, Marshall University President Jerry Gilbert praised the colorful environment and hospitable communities he encountered during his recent stint in India. During an eight-day recruitment trip last week, Gilbert traveled to Mumbai, Chennai and Hyderabad to speak with prospective students and meet with U.S. consuls in India. Gilbert journeyed with Stephanie Collier Hurley, director of Marshall’s INTO program, Avinandan Mukherjee, dean of the Lewis College of Business, and Wael Zatar, dean of the College of Information Technology and Engineering. Together, they introduced Indian students to the unique opportunities available at Marshall through academic and personal development. Gilbert said 80 to 100 Indian students were accepted and scheduled to study at Marshall this fall, but the U.S. consulate in India denied their visas. After talking to American consuls, Gilbert and his team discovered many Indian students are nervous for their interview with the consulate because they are given only two minutes to explain their decision to study at Marshall. Based on this interview, their travel to the U.S. is denied or approved. The consular staff relayed that many students use a scripted speech in their interview because of these nerves. “If they come in and repeat something that has obviously been fed to them as a coached response, they’re going to reject it even though the student may be totally legitimate, because their assumption is that the student is not legitimate at that point,” Gilbert said. Based on this new information, Gilbert said he and Marshall administrators can better advise Indian students endeavoring to study at Marshall. Gilbert said he visited Indian universities during his trip, where many students expressed a strong interest in coming to Marshall for graduate degrees in computer science, business and engineering. He said he was amazed by how many students had dreamed for years about traveling to America. At these universities, Gilbert said he and his team presented a video created by INTO about an Indian student from Hyderabad who is studying at Marshall. Gilbert said he thought the video was very effective and “was a fabulous expression of Marshall to the Indian students.” Gilbert said many Indian students who study at Marshall are originally from Hyderabad, so the video is one way to recognize Marshall’s Indian student population and connect with prospective students living in Hyderabad. Gilbert described India as “a country of contrast,” evident in the juxtaposition between families living under one tarp on a street corner and citizens who are able to attend university or travel. Gilbert remembered one day during the trip when he was riding to meet with students and his driver took him through a run-down area of town. Gilbert said he was surprised when the driver said the meeting would be right around the corner, as university students generally resided in more affluent areas of town. The event was in the auditorium of a temple in the neighborhood, with around 200 attendees present. Gilbert said this was their largest event in India and the students present asked many questions about the programs at Marshall. Gilbert said by the end of the trip, he felt he fit into the Indian setting because of the friendly, respectful and welcoming people he encountered. One U.S. consular staff member in Mumbai even asked if there had been a movie about Marshall, so Gilbert said he mailed him a copy of “We Are Marshall” when he returned from the trip Nov. 9.